A left-leaning student movement could provide an alternative to the right-wing dominance of Ukraine’s street protests and parliamentary politics. The student-occupied Education and Science Ministry in Kiev last week was like a scene out of Ten Days That Shook the World: Evoking the revolutionary organizations that took over St. Petersburg’s Smolny Institute in 1917, students from a variety of left-leaning groups hammered out radical demands under the chandelier in the neoclassical assembly hall, breaking for meals of pickled vegetables and open-faced sandwiches. Outside the hall, a dozen self-defense volunteers with improvised helmets, breastplates and billy clubs were patrolling the building and its perimeter. “We’ve been expecting Svoboda will try to kick us out,” said Ilya Vlasiuk, an activist who was guarding the sealed offices on the second floor, referring to to the ultranationalist party whose militant wing has attacked progressive activists, including Vlasiuk, at the Euromaidan demonstrations around Independence Square. Although students played a crucial role in the initial Euromaidan movement, their role decreased after police beat protesters on November 30 and other segments of society came out to call for an end to the corruption and police brutality of Viktor Yanukovich’s government. Meanwhile, ultranationalists and neo-Nazis from groups like Svoboda and Right Sector took over Euromaidan’s self-defense forces, and leaders linked to these two groups were appointed to high-ranking security positions in the new government. Svoboda MP Iryna Farion was being considered for education and science minister this week, according to a leaked list published by the news site Zik, a move the student occupation strongly opposed. Instead, a student-approved candidate was appointed minister. The successful student occupation of the Education Ministry—the first such event in post-Soviet Ukraine—has raised the possibility that a progressive student movement could provide an alternative voice to the right-wing dominance of street protest and parliamentary politics in Ukraine. With no left-wing party in parliament, progressive activism “is much weaker at this point” than the far-right trend, Volodymyr Ischenko, deputy director of the Center for Society Research and an editor of the progressive journal Spilne (Commons), told The Nation at a roundtable on the Ukrainian crisis organized in Brussels by the Postglobalization Initiative. But the student movement “is one of the points where it may be possible to create this counterbalance,” he said. On February 21, several hundred students from at least three Kiev universities representing organizations including the Direct Action Student Union, Student Coordinating Council and Pushback marched on the Education Ministry, a light-orange neoclassical building in downtown Kiev. After minister Dmitry Tabachnik and his deputy Yevgeny Sulima, whom students accused of repressing student activism both during and before the Euromaidan protests, refused to come out and meet with them, they took control of the building. (The ministry’s security was not in place following the political upheaval.) They soon put forth demands including the dismissal of Tabachnik and Sulima, student approval of the new candidates for the position, an audit of the ministry and regular online publication of its financial transactions. A final key demand was the adoption of a reform bill—one of several proposed—that would transfer many functions of the Education Ministry, including the development of government standards and the accreditation of academic institutions, to a new independent agency. “The idea of occupying the Education Ministry had been around for a while, as other ministries were being seized. But on the 21st we mobilized a lot of people, and there was a chance to do it, since there was no resistance,” said Andriy, a member of the anarchist-leaning Direct Action Student Union who asked his last name not be used because he’s participating in negotiations with the new minister. A variety of government buildings have been occupied over the course of the protests, including the Justice Ministry and Energy Ministry. On January 21, students and other activists including Andriy also occupied the office of the Interior Ministry to protest the arrest of six students and one recent graduate at protests in the city center. On the Monday after the students occupied the Education Ministry, the parliament dismissed Tabachnik, and on Tuesday night Farion announced she wouldn’t accept the position if it was offered to her. Instead, the parliament appointed Serhiy Kvit, director of the Kyiv Mohyla Academy and one of three candidates approved by the students, as the new minister. After first declining to immediately support an audit, Kvit signed a decree ordering an independent audit of the ministry and promised he would sign an order to publish financial transactions online. Kvit also appointed Inna Sovsun, a teacher and former employee at the Center for Society Research who is supported by many progressive student activists, as his first deputy minister. The student activists are still negotiating to have several of their other demands included in their favored education reform bill, which will likely be passed in the near future, Andriy said. In addition to its immediate demands, the student occupation drafted a “Road Map for the Development of Ukrainian Education” with forty-nine proposals ranging from guaranteed living-wage stipends to annual education funding of at least 7 percent of GDP. 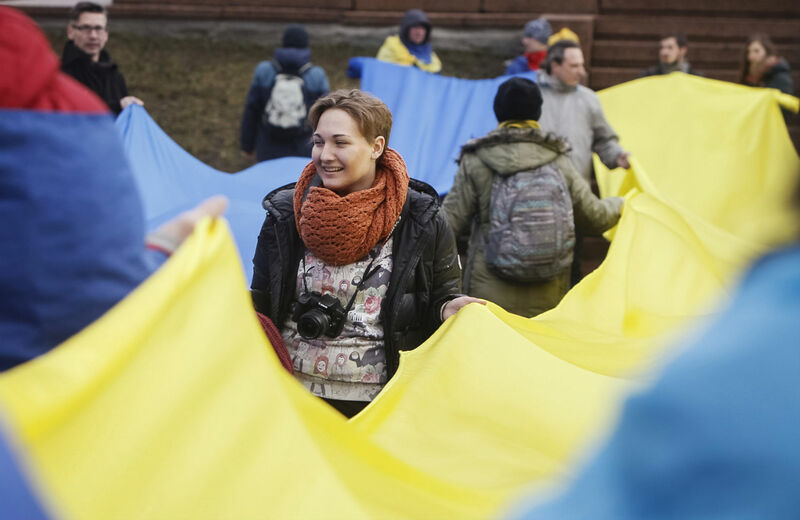 According to Ischenko, the Education Ministry occupation marked a new level of student mobilization since students set up a tent camp and held hunger strikes to agitate for Ukrainian independence in 1990. More recently, students have agitating against rising education costs, including fees for missing class and using services like the library. Students also agitated for social and economic reform in the first days of the Euromaidan movement, demands that were later pushed out by ultranationalists who have attacked feminist, anarchist and labor union actions. “It was probably the point where the left-wing influence was highest, which still wasn’t much,” Ischenko said of the student actions at Euromaidan. Now the occupation showed that the student left has “become active again,” Ischenko said, and could even be the genesis of an alternative to the far-right rhetoric that has enjoyed a prominent voice in the movement and the new government. Right Sector, whose social network page features extensive neo-Nazi imagery, has been patrolling alongside police and has ties to the new security service head, while a founding member of the neo-Nazi party that became Svoboda has been appointed head of the national security and defense council. Meanwhile, Svoboda parliamentary deputies have been pushing to remove gun control regulations, ban communist ideology and essentially forbid the broadcast of Russian-made television and radio programs. Students will need to keep up the pressure through the reform process as they negotiate to include their demands, and they may need to protest against the new minister if he doesn’t follow through on his promises. Already, Kvit only signed the audit order after first refusing to do so during negotiations with students. “If they could be very radical and decisive they could prolong this discussion” of far-reaching education reform, Ischenko said. Already, organizers have been able to teach less-experienced students “an understanding of systematic demands, organizational fundamentals and direct action methods,” said activist Bohdan Biletsky of Direct Action. Perhaps the student movement can eventually reintroduce discussion of Ukraine’s looming economic problems—sure to worsen under the austerity conditions that will likely accompany a bailout—on Independence Square, although Andriy said Direct Action would focus for now on education-related demands. As always, the challenge is unity among student organizations.